ARMY KID: My father served in the Indian army so our family followed him around wherever he was transferred, at least for vacations, including remote locations along the border in Sikkim and Assam. We spent a lot of time on long haul trains like the Tinsukia Mail (with our dog/s!) traveling around the country to military outposts. The good news is that every army station, no matter how tiny, had a good library, and somehow my mother always managed to make us feel right at home. SISTERS: I am one of four sisters and growing up surrounded by amazing girls and women had a lasting impact on me. My two older sisters were a year apart and then there was a long gap of eighth years before my younger sister and I came along. To us younger two my older sisters epitomized sophistication, smarts, and success. Sadly, we now live on three different continents, but, wherever they are, my three sisters will always be my heroes! CLUMSY: I was a famously accident prone kid. A bit of a daydreamer I was always bumping into things, or having hot liquids dropped on me, or getting bitten by everything from bees hiding in flowers to cute little puppies. Years ago, when our family went to see a circus there was a clown in it, called Bong, who was just as clumsy as me. Even now my sisters still call me Bong, in public, on social media, and everywhere else...argh! I've stopped being mortified by it and trying to explain to people that I'm not Bengali and have nothing to do with any other kind of bongs (rolling my eyes!) These days I'm not as clumsy any more but still a daydreamer! SLEEPING STARS: It is common in India to have a janampatri or astrological chart drawn up for all the children in the family. It's supposed to predict your personality and prospects and is used to check for compatibility with future life partners. Even though no one in my family actually believed much in any of this our mother had all our janampatris drawn up--and mine (to the lasting amusement of my whole family) said that my stars were all in sapta avastha, meaning they were sleeping on the job! One of the reasons I wrote about Leelavati, a girl with a bad janampatri, in my book Starcursed, was because of that experience. DOGS AND CATS: We grew up with all kinds of pets in the family. Dogs and cats, mostly, but my Nani once rescued an injured eagle fledgling and my father had buffaloes in our farm in Haryana! We've fostered many rescue animals in the US including ten street dogs from India. Our current family pets include our dog Yogi, and our cats Bikky and Zara. 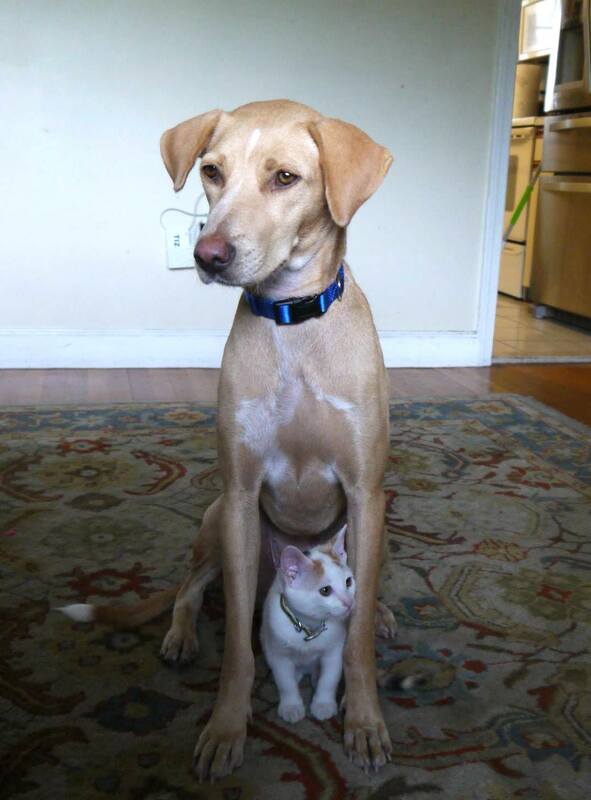 The dog and cat in this picture (Ruby and RBG...yes, RBG is named after Justice Ruth Bader Ginsberg!)) were my first fosters from India and they have the cutest backstory! RBG was kidnapped by monkeys when she was a kitten. Her rescuers couldn't find her mother after they retrieved her from the monkeys, so she was raised with the street dogs they had in their shelter. There, she formed a bond with her BFF , Ruby the dog. But Ruby was supposed to fly to the US and be put up for adoption, so RBG was sent along too. They've been adopted together by an amazing woman and live happily in Boston today! BUDDING WRITER: When I was seven or eight I wrote (and illustrated!) a picture book about a pony named Roni. My parents kept it tucked away safely all these years and gave it back to me after I published my first book. I think it looks pretty cool alongside my other books! It's so strange to think back to eight year old me dreaming of being a writer and growing up to actually become one. Whatever your ambition, dream on! !